I received this recipe photo and notes from a friend in Europe. It looks to be simple, delicious and a perfect "peasant food" in that it is filling and satisfying. I can see this very much as a taste of home that would be most welcome after a hard day's work. Here is an ancient dish that is exclusive to my tiny Flemish region and still appears in a number of variations. We call it Stampers or Karnemelk Stampers. Stampers are also known under other names like Tutjespap etc. This is typical poor people’s food. The dish is basically potatoes mashed with buttermilk instead of plain milk. Plain milk, butter and cream were for the richer people; the by-product after churning the milk was buttermilk, to be fed to either the farm animals or the poor. Karnemelk is Dutch for buttermilk, hence the name. Stampers refers to the verb stampen, where potatoes used to be crushed (gestampt) with, indeed, a long wooden pestle. This is so simple to make: peel, boil and mash potatoes, add warmed (not boiling!) buttermilk a bit at a time and turn the potatoes into quite a thick soup. Add salt and pepper, and if available a fresh chiffonade of sorrel leaves from the garden. In the old days this was eaten with a slice of dark bread and cheese; often the cheese would be Gouda, but mostly it was made with a softer Belgian abbey cheese. A real must was to add a little beurre noisette, butter melted until it starts to smell like hazelnut. That was it. In my younger days, it was mainly a dish served in the Lent period. Nowadays, you can find this dish in a number of restaurants. 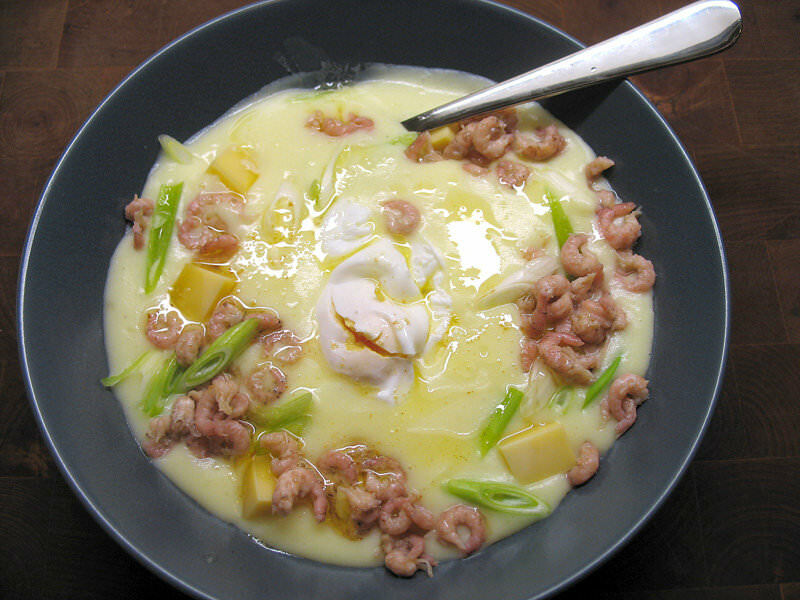 Some bistros have revived the dish and occasionally offer a dish like I made, but a bit more elaborate with everything in it; cheese, shrimp, poached egg, beurre noisette. I definitely want to give this a try soon.